I’m so excited to share today’s post! 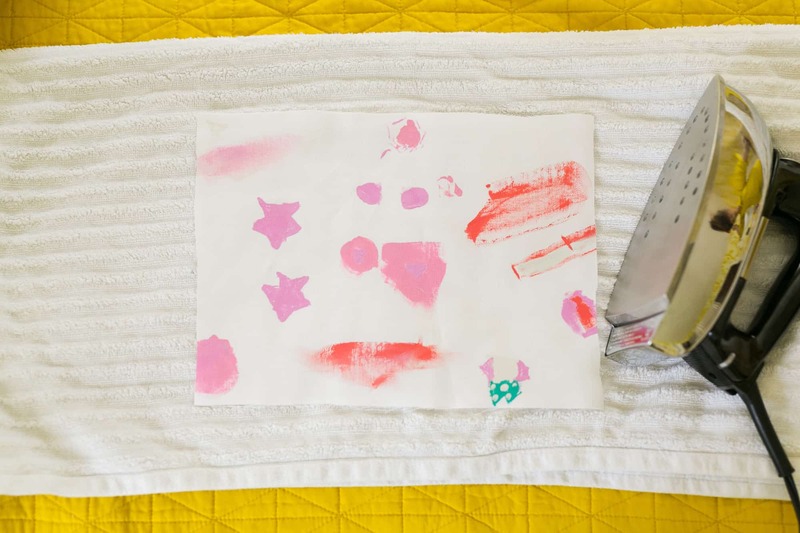 A few weeks ago at our annual summer camp (at which we make a LOT of crafts), we taught the girls to make our own printed fabric. 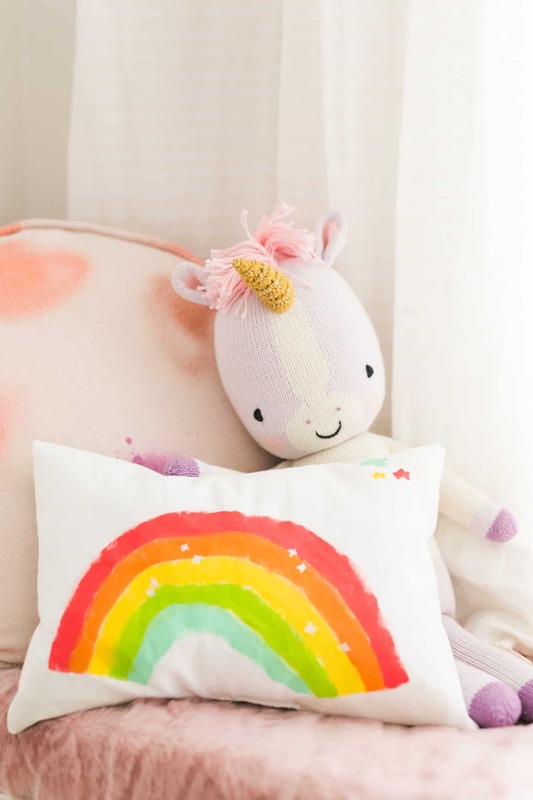 This rainbow above is a design by my niece, Bella, in fact! We had so much fun painting our own fabric together. One of the best lessons I ever learned from my high school home ec teacher (and hero!) was that anything you see at a store you CAN make at home. I never forgot that and now I try to pass it along to my nieces and daughter any chance I get! 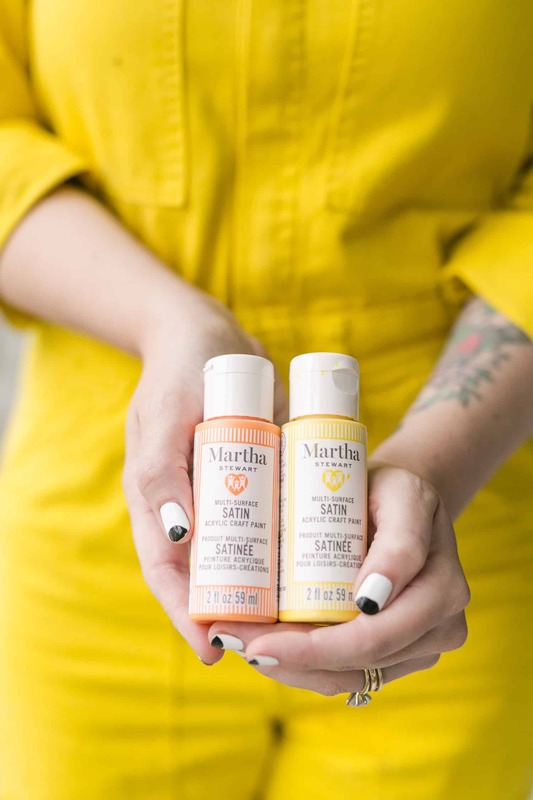 Today, we are partnering with Martha Stewart craft paint. My favorite craft paint of all time! I have been using it since it came out yearssss ago. It’s multi-surface and family-friendly, so you can use it for regular painting projects, but also for painting wood, fabric, metal or plastic. It’s pretty neat and exclusively available at Michaels! A quick note about color selection! People always ask me if I choose the colors when Nova paints or if she does (which surprises me, honestly, because it’s obvious). I choose them! 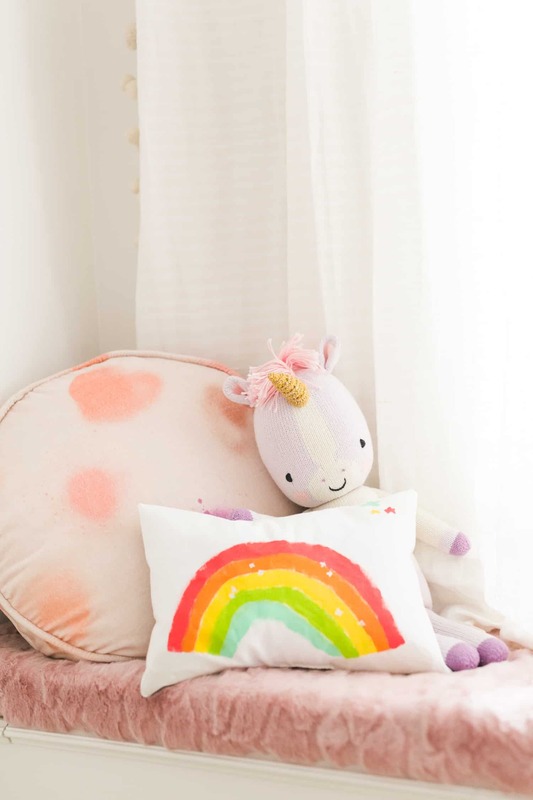 If you have a kid who is too young to have opinions yet, choose colors YOU like. There is nothing wrong with that! It’s honestly one of the keys to getting nice looking toddler art! That’s not to say that I never give her all the colors, because I do … and then she mixes them all … and then it’s brown. Haha! One thing I love about Martha Stewart paints is that they come in really interesting colors. Primary colors can get boring (FAST) especially when you let your kiddo paint almost every day like I do. Good colors for the win! 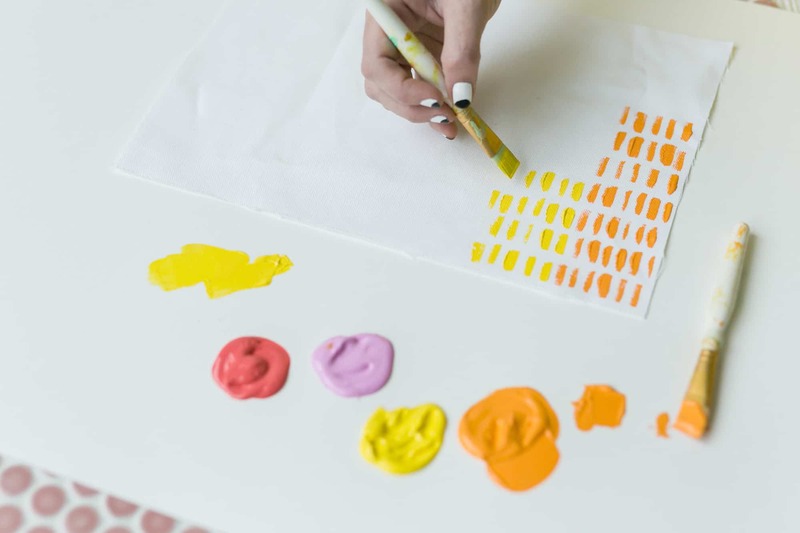 To make your own patterned fabric, start by painting your fabric. Now, there are a MILLION ways to do this. Here are just a few ideas! -Use stamps (you can even make your own stamps with craft foam or cut up veggies). -Use different brush sizes. We like the Martha Stewart ones because of their easy grip and they come in lots of size options. For Nova, I like to mix up giving her really small brushes one day and big chunky ones the next day. -Try masking. 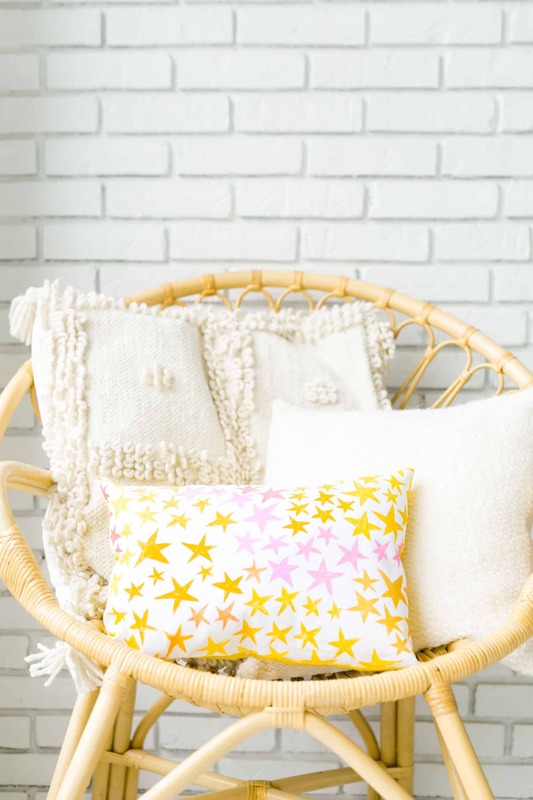 Just use some masking tape to create a pattern on your plain fabric, then paint over it and wait until it is dry to remove the tape. 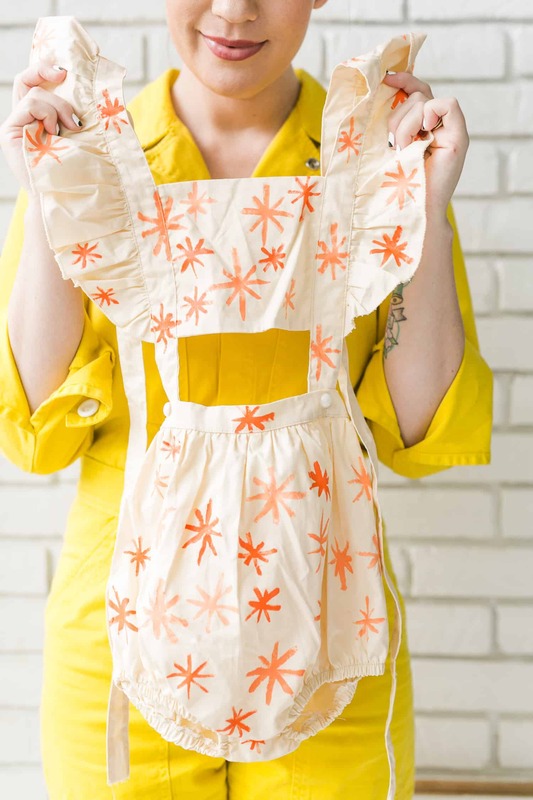 -Splatter paint makes really cute fabric (pro tip: go OUTSIDE for this one). Here’s the pillow I made. I hand painted all these stars. It took forever, but since Nova likes to paint for a longggg time now it worked out well. 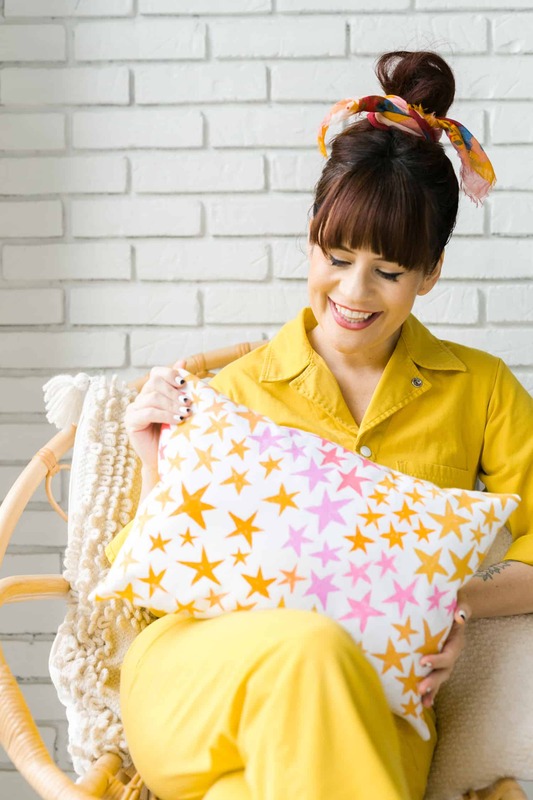 And here’s the pillow Bella made! So sweet, isn’t it? I have been meaning to pack it up and mail it to her, but I kind of want to keep it! And just for fun, because I am crazy and I have CRAFT FEVER right now, I also painted this little romper for Nova! 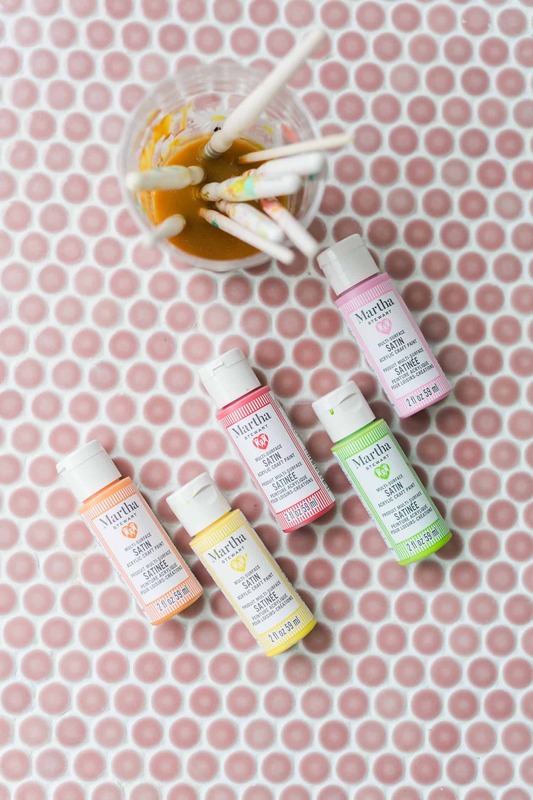 If you make a project using Martha Stewart paint, I’d love for you to tag us on Instagram! We LOVE seeing what you are making. Credits/Author: Elsie Larson. Photography: Amber Ulmer . Photos edited with A Color Story Desktop.